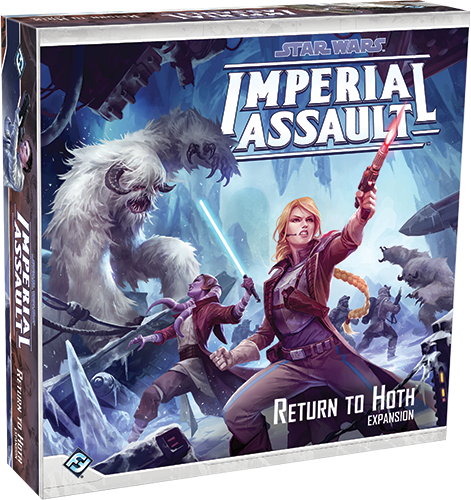 Fantasy Flight Games is proud to announce Return to Hoth, a new expansion for Imperial Assault! The secret Rebel base on Hoth has been discovered by the Empire. Imperial Star Destroyers blockade the planet from above and Imperial forces descend the surface, led by Darth Vader, and bringing the battle to the entrenched Rebels. As the Rebel heroes flee from the icy planet of Hoth, they have no idea that events ahead may force them to make a desperate gamble and return to the dangers of Hoth! 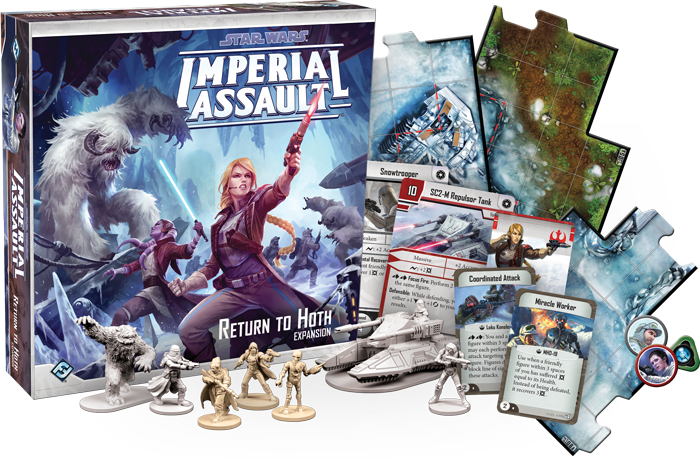 Return to Hoth is a new expansion for Imperial Assault, offering new content for both campaigns and skirmishes. A brand-new full-length campaign invites you to escape the aftermath of the Battle of Hoth and protect a colony of Rebel refugees from the depredations of the Empire. Meanwhile, four new skirmish missions bring your forces to the icy expanses of Hoth and new rules for four-player skirmish games invite you to experience massive, multi-fronted skirmishes with up to three opponents! Whether you’re playing a narrative campaign or a fast-paced skirmish, the addition of thirty-seven double-sided terrain tiles invites your heroes to travel the snowy wastes of Hoth and race through the claustrophobic corridors of Echo Base. 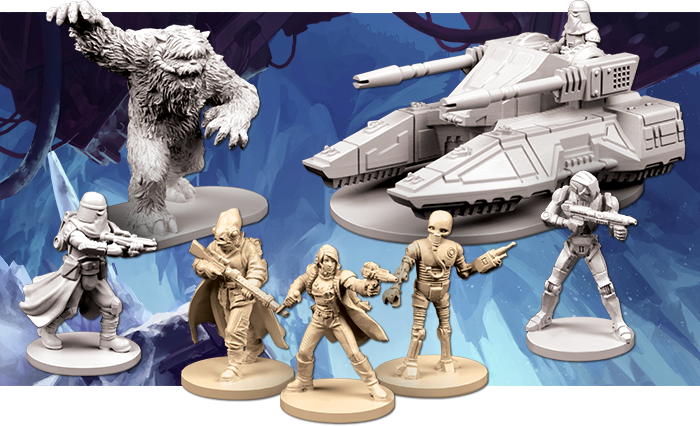 Sixteen sculpted plastic figures also arrive for you to command in campaigns and skirmishes – three new heroes, six Snowtroopers, two Wampas, four HK Assassin Droids, and a SC2-M Repulsor Tank! 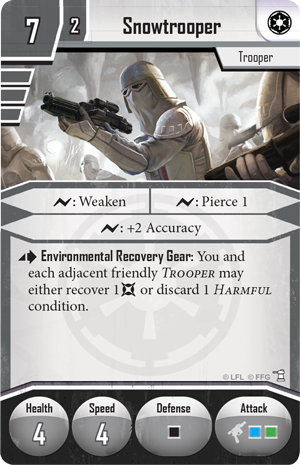 With new Agenda cards, Class cards, Deployment cards, Item cards, Mission cards, and Supply cards, Return to Hoth expands every game of Imperial Assault. In addition, four new Ally Packs and Villain Packs correspond with the Return to Hoth expansion, highlighting the most iconic characters introduced in this expansion and offering new cards and missions for campaigns and skirmishes. You can command Imperial forces across the sector with General Sorin, seek a diplomatic solution with Leia Organa, fight bravely with the Echo Base Troopers, or punish your foes as the deadly bounty hunter, Dengar. For more information on these figure packs, visit their announcement article! Return to Hoth contains three heroes, six Snowtroopers, four HK Assassin Droids, two Wampas, and one SC2-M Repulsor Tank. Three new heroes join the forces of the Rebel Alliance at Echo Base in the Return to Hoth expansion. 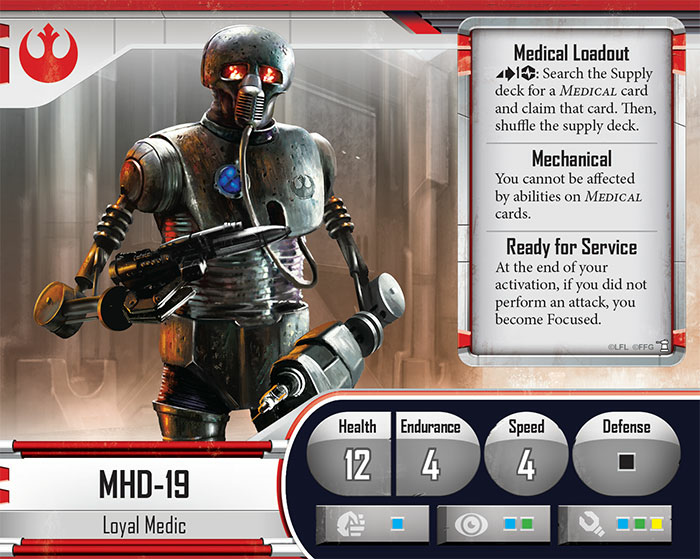 You might heal your friends and protect them from the cold as the loyal medical droid, MHD-19. MHD-19 has been trained in thousands of medical procedures and will go to any lengths to protect his companions – even taking up arms against Imperial soldiers! Alternatively, you could join the Mon Cala special forces and take down your foes from afar as Loku Kanoloa, a deadly marksman. Loku Kanoloa relies on clever battlefield reconnaissance to bring down his targets, placing recon tokens and gaining a host of benefits for attacking enemies with recon tokens. Finally, you may engage in vital operations for the Rebellion as Verena Talos. This deadly operative is eager to take revenge for the destruction of Echo Base, and she’s a fearsome opponent in a campaign or a skirmish. Each of these heroes also features unique talents and abilities in their Class decks, which make playing each hero a dramatically different experience. We’ll explore all of these heroes in much more detail in a future preview. 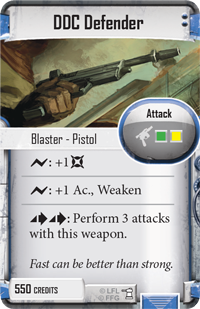 New Item cards and Supply cards allow you to further customize your heroes as you move through the campaign, whether you’re on Hoth or not. You might purchase a DDC Defender , a pistol that can perform up to three attacks every turn, or you might customize your weapon with a Under-Barrel HH-4 modification. 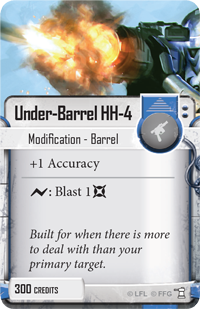 This expanded barrel not only improves your accuracy, it helps you spread your fire across a group of figures. 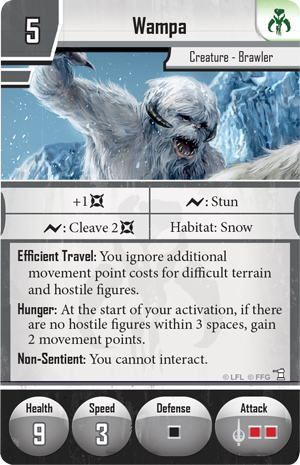 Return to Hoth also introduces nine new Command cards, granting you new tactics to employ in the skirmish game. Set a Trap allows you to choose any map tile at the start of a round. If you and your opponent both have a figure on that tile at the end of the round, you can perform a free attack with your figure! 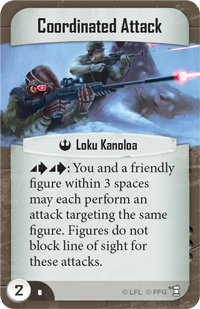 If you field Loku Kanoloa in your army, you may use Coordinated Attack to have two figures attack the same target simultaneously, potentially destroying a single large target before it can strike! Whether you field these new Rebel heroes in the skirmish game or in your campaign, they have the power to turn the tables against the forces of the Empire. The Rebellion gains access to several new heroes, but new figures are also eager to join the Imperial and Mercenaries factions. Snowtroopers are similar to Stormtroopers, but benefit from improved surge abilities and insulated Environmental Recovery Gear that can protect them from the freezing cold of Hoth. As the Snowtroopers swarm forward on foot, you can support their attacks with the raw firepower of an SC2-M Repulsor Tank. Meanwhile, the Mercenaries of the galaxy gain some deadly new warriors and monsters. HK Assassin Droids use their advanced technology to gain the upper hand on biological targets and no creature knows the icy wastelands of Hoth as well as the Wampas . When faced with such dangerous enemies, even the greatest Rebel heroes will have a fight cut out for them. The Empire receives more than just more figures, of course. Two new Agenda sets – Natural Warfare and Defensive Tactics – open the door for you to pursue the heroes with punishing effects throughout the campaign. You may equip your warriors with personal shield generators, or loose a deadly Creature against the Rebels. 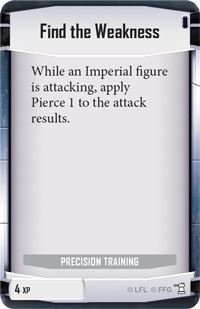 In addition to these Agenda cards, two new Imperial classes allow you to modify your forces and tailor them to suit whatever gameplay style you prefer. The Precision Training class improves your figures’ attacks with cards like Find the Weakness , while the Armored Onslaught class allows you to use the Empire’s Vehicles to destroy the Rebels with Explosive Munitions . With these new Class cards and Agenda cards, the Empire gains a host of punishing effects to level against the Rebellion. Return to Hoth also introduces a new type of mission as the beleaguered Rebels flee from the Battle of Hoth. This new type of mission is a threat mission, and it gives the Imperial player a new way to demonstrate the power of his nearly limitless resources. 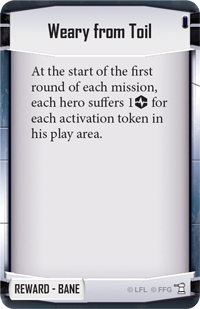 Like normal side missions, two threat missions enter play at the beginning of a campaign, and the heroes may choose to undertake the mission anytime that they would choose a side mission. 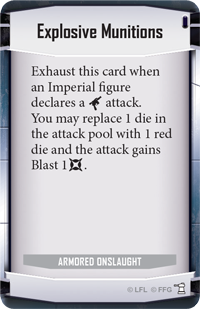 The heroes may choose to ignore threat missions – but as long as a threat mission remains in play, the Imperial player has a Bane Reward card at his disposal. 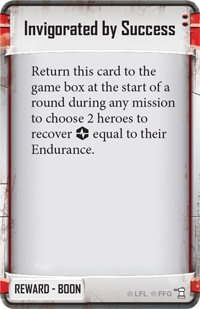 For example, while the Survival of the Fittest threat mission is in play, the Imperial player gains the Weary from Toil Bane Reward card, which forces each hero to suffer strain equal to his activation tokens at the beginning of each mission! 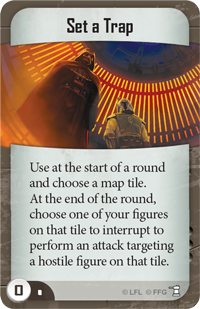 However, if the Rebels can fight back against despair and complete a threat mission, the rewards can be significant. 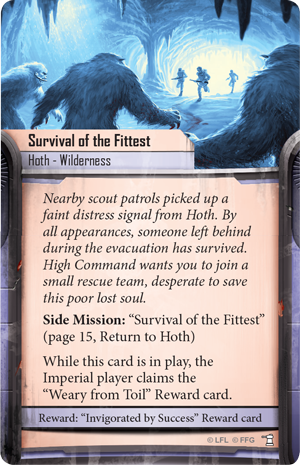 If the Rebels successfully complete Survival of the Fittest, the Weary from Toil Bane is converted into the Invigorated by Success Boon, which the Rebel heroes can use once to recover from strain. With the addition of threat missions to the Return to Hoth campaign, the Empire’s power grows more oppressive and the Rebels receive an additional incentive to bring them down. The Rebels may escape from the Empire at the Battle of Hoth, but Imperial forces will never stop searching for them. To stop Imperial operations and safeguard a colony of helpless refugees, the heroes of the Rebellion even dare to return to Hoth! With new heroes and dangerous villains, alongside dozens of new cards for the campaign and skirmish games, Return to Hoth changes your games of Imperial Assault forever! Look for Return to Hoth at your local retailer in the fourth quarter of 2015.